Mr. Takeo Kuroki, founder and first chairman of Zen Nippon Airinkai, defines Nishikigoi as follows: Nishikigoi is a generic term for Koi which have colors and patches and are raised for appreciation. The historical origins of Nishikigoi are as follows: 200 years ago in Niigata Prefecture's Yamakoshi Village and the surrounding areas, the farm-raised edible Koi started mutating. 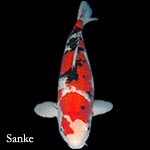 Some of the breeders noticed, on rare occasions, Koi with red and yellow patches. From this point they started to breed these colored Koi. In the Meiji Era, the phrase beautiful Koi was widely used and made the rounds among the people and so varieties such as Kohaku were developed. The Taisho Exposition was held in the 3rd year of the Taisho Era (1914), which is when Nishikigoi started to become more popular in society. 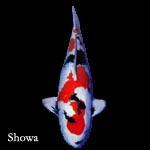 The varieties produced and established in the Taisho Era are Taisho Sanshoku, Shiro Utsuri, Ki Utsuri, and Asagi. In the Showa Era (1925) Showa Sanshoku, Kin Uchiwa, Gin Uchiwa, and Kin Kabuto were produced. After the war, breed improvement was temporarily suspended, but with the introduction of Nezu Ogon, the Hikarimono variety was produced leading to the golden age of Nishikigoi. The creation of the Doitsu lineage with varieties such as Shusui, crossbreeds of German Carp and Nishikigoi, and of the Ogon variety, played a prominent role in todays Nishikigoi development. 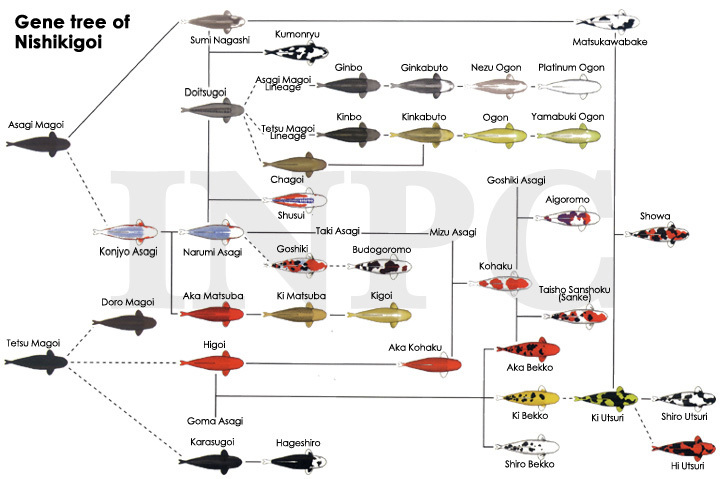 The photo below shows the Koi Gene Tree. It represents the necessary crosses that were made in order to produce the Koi we see today. 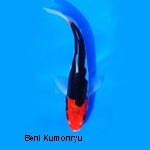 Some Koi varieties were produced from rare mutations. There are over 100 different varieties of Nishikigoi, including the fixed variety and their variations. INPC specifies 26 as fixed varieties and other crossbred varieties are called variations. Below are the accepted varieties that are considered fixed. 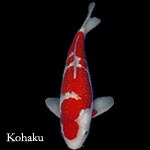 Click on the Gallery link to view ALL varieties that are available in the world of Koi today.